Leader of the French National Front party Marine Le Pen has described a fraud probe into her party launched in the EU parliament as “political manipulation” and has threatened counter legal action. "We have nothing to reproach ourselves for, neither in this case nor in any other," Le Pen told journalists in Strasbourg on Tuesday, according to AFP. EU Parliament President Martin Schulz asked the European Anti-Fraud Office (OLAF) to look into possible fraud concerning salaries paid to 20 assistants to European MPs, who also turned out to be listed by France’s National Front as its officials. "One cannot be paid by the European Parliament and work for a party," Schulz explained on Tuesday. The amount of the EU funding spent on the salaries to the twenty assistants is estimated at €7.5 million ($8.06 million). "Mr. Schulz, who is a socialist, on instruction from [French PM] Mr. Valls... fulfilled his contract,” Le Pen said. “This little political game within days of elections, it starts to get a little rough." National Front Vice-President Florian Philippot said on Twitter the case against the party was a “bogus” one. "In a way, Schulz is right," he added, according to Reuters. "Our assistants don't work for the European Union but against it!" 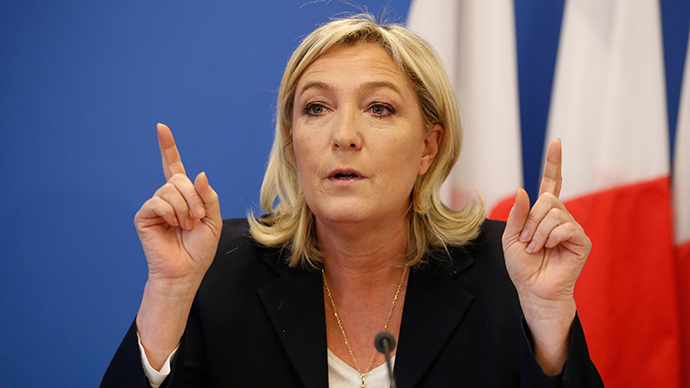 The National Front is leading in the opinion polls ahead of local elections in France on March 22 and 29, the Local reports. The party celebrated two major victories in 2014. In September, it grabbed two seats in the upper house of parliament for the first time. In May, the anti-immigration and anti-EU National Front came top and secured 24 seats in the European Parliament elections, which demonstrated a rise in popularity of both right-wing and Euroskeptic political parties.